This thread is is acknowledge members of this forum who are no longer with us. If you'd like to see a permanent tribute to anyone in this thread please let me know. We'll need about 300 - 500 words or thereabouts and a picture or three. Just e-mail to me and I'll load it. Be honest to yourself, your family, friends and customers, never get bigger than the game we play and always acknowledge the people that have helped you along life’s journey. What an awesome way to live your life by and these were the principals Tiny adhered to and why he was so liked by all that knew him. At 39 years of age he had achieved what would have taken most three life times, he was one of the most respected Custom rod builders New Zealand has ever seen and I had the pleasure of seeing this gentle giant work his massive hands around the most delicate of thread work when assembling a rod to produce a work of art. Tiny was also an excellent teacher and he passed his expert rod building skills onto his young female apprentice Chloe Paterson. Tiny and Chloe would spend hours putting together his high end Synit rods for customs here in New Zealand and around the world. In the later years he became known as some what of a soft bait guru, this form of fishing had given Tiny a rejuvenated vigor for fishing and I summed up his enthusiasm on several occasions as being like a five year old kid on a sugar overload. 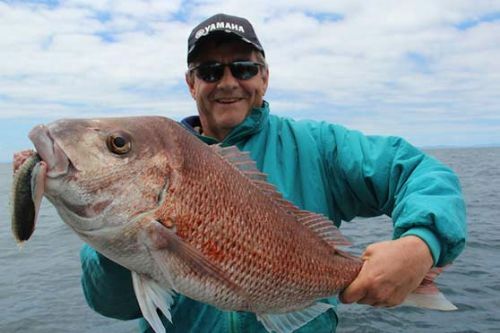 He also had an uncanny knack of being a bit of an impromptu comedian and on one occasion suckered a well known charter skipper out of a several hundred dollars on a bet that you could never land a snapper over 8kg on a softbait. His dream will live on in the work he started and the skills he left behind. With a day on the boat just wetting a line, and to get a few fish is just great. But to me the thing that I treasure most, is my fishing mate I call “Tiny”. “My name is Norm”, this big joker said, as he drained his pint with one sup. “Whattaya drinking Johnnie “ He said, and I answered “A bourbon and coke”. When he breasted the bar, with his bucks in his hand, I just stared at him with awe. He’s the biggest bugger I’ve ever seen, how the hell does he fit through a door! ‘Till I stopped and started to listen to him, his fishing he really knew! We both agreed we would go out soon, and together wet a line. From now on I’m calling you Tiny mate, and he said “Aw, we’ll just wait and see”. Most fishos all acknowledge him, and say “there goes Tiny Coe”. Then I asked “What sort of a boat have you got?” Tiny said, “A Stabi Craft”. Awesome, I thought, a decent big boat, what really could be neater? Then Tiny explained that his pride and joy, was only a small two seater! As I was standing in front of him, my nose level with his nuts! I agreed to go with Tiny, to the local fishing ramp. He hopped in and paddled us out a bit, we were still afloat, Holy Cow! “Turn around” Tiny said, “and face the bow, hold on and kneel on the seat”. The wind nearly blew my eyeballs in, bloody hell, this boat was fast. But Tiny’s little Stabi Craft, was a truly amazing boat. Though nothing was said, we both really knew, that we’d each found a real fishing mate. We fish all the time, my mate Tiny and I, and he now proudly calls me dad. I know a bit about fishing, but I’ve learnt a hell of a lot from him. In Tiny’s little pontoon boat, which still looks like brand new. So we drove down the road, looked over the place, and both joined the local Cossie. These blokes all had twenty footers, and could fish many miles from home. The giant sitting in the rear, and me up the front as the dwarf. We knew the spot, the tide was right, to do battle with some trevs. 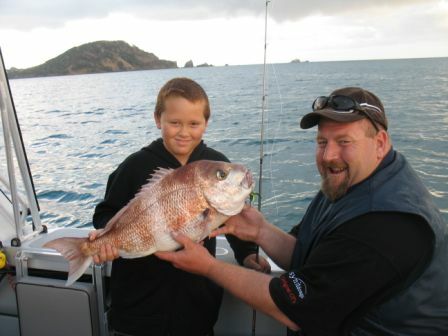 We had a ball on the Manukau, on seas flat as a flounder’s bum. 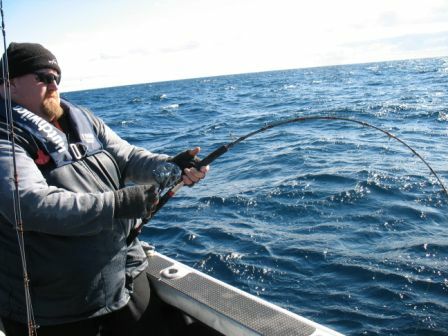 We both used a lightweight Penn fishing rod, with 3kg line on the reel. We had a beer with the rest of the blokes, and had a bit of a yarn. I glanced at Tiny, gave him a wink, and said “just enough for dinner”. We went outside, heaved up our bin, when Tiny let out a great fart. Until our fish all hit the scales, and then they went real quiet. But the talk went round the Cossie club, that it was just beginners luck. We must be doing something right, as the results do clearly show. 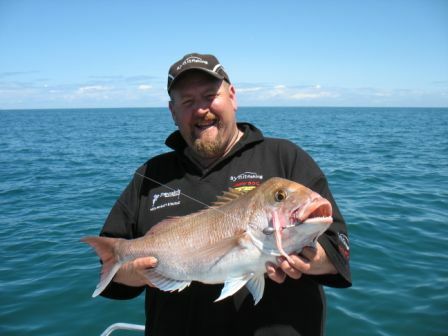 The best thing you can have on your boat, is a bloody good fishing mate! My mate and I have stood firm. 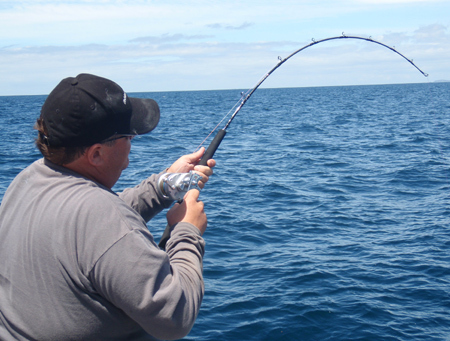 Catching plenty of fish, with big messy baits,on a lure or softie or worm. But sadly to say, with a tear in my eye, my bubble of life has just burst. The news I had to tell everyone, was nothing short of the worst. Tiny, the Giant suddenly passed away, with his mate the gnome left reeling. Nobody on earth could understand how this loss has left me feeling. No words ever written could express my grief on the loss of my greatest friend. But though Tiny wasn’t religious, I know when he met the grim reaper. He chucked our mate in his heavenly bin, and called him a bloody good keeper. 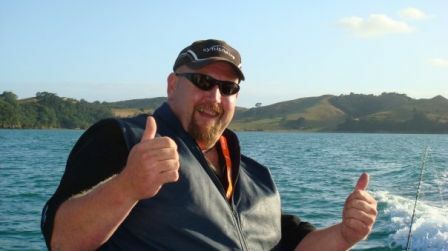 Rest in peace big buddy…..
Shane Kelly was one of the marine industry’s characters – a natural entertainer and accomplished writer, an entertainer, and all round good bugger. "Shane came to stay with me in the mid-1980s at my holiday place at the Whangarei Heads" said Grant Dixon. Shane was writing for one of the boating magazines and wanted some photos of the Whitbread Round the World Race yachts as they came down the coast on their way into Auckland. Not one to burden his hosts, Shane was quite happy to pitch his pup tent and curl up in his sleeping bag. It was an unremarkable event, but it laid the foundation stone of an enduring friendship. Over the years our paths crossed frequently, sometimes work-related, but the more memorable occasions were social. The Kinloch Trout Fishing Tournament was a yearly event, not for the faint hearted and full of the most wonderful camaraderie. Shane was at the forefront on many of these events and never let the team down. Always an excuse to bring out the guitars for an evening’s entertainment, in those early days guitar playing was still on Shane’s bucket list, but he had a suitable repertoire of ditties and his singing was more than reasonable. Ten years ago, encouraged by Shane, the Kinloch guitar players got together with our maestro, Keith Patterson, to refine our talents. Neither Shane nor I would ever look like challenging Mark Knoffler, but it was the first step of his wish to be a rock star and entertain his friends. Shane worked hard to learn guitar; he was a perfectionist, and it gave him a different focus from the cancer that would eventually take him from us. Practice nights consisted of an update on his health, a bit of guitar and a bit of rum. Shane was charismatic. Practice nights were often attended by his mates wanting to share the good times with him. Music empowered Shane: “Right, fellas, we’re good enough to start a rock band.”There were a couple of issues, though – we didn’t have a drummer or a bass player. In typical Kelly fashion, he placed a couple of adverts and in no time we had a band. The band Retro was undoubtedly a great joy to Shane over the last few years. He loved being on stage with his trusty guitar, along with the road trips, the groupies, making good times with his mates, and sharing his talents with friends and family. The band mainly played at family weddings and fundraising events, but the ‘home base’ of Swashbucklers Restaurant was where Shane excelled, performing to his industry colleagues, his fishing mates, and his much-loved Lindsey and boys. These special times we shared with Shane gave us an opportunity to share soul secrets that men are often reluctant to talk about. Talk about sentimental stuff, old memories and how important it was for Shane to feel the love. And loved he was. Shane’s elder brother Michael led his funeral which, Shane had told him, would include his life, warts and all. Shane was born a twin; his twin sister died at a few days old. He always wanted to be a journalist in the traditional style, and after gaining his diploma at AUT, he worked with North Shore Times before moving to Melbourne as parliamentary reporter for the Herald Sun. It was the days of cheap lunches and booze. During a stint on FM Radio, he staged an April Fool’s gag that reportedly had Ayers Rock sinking. In the UK, he worked with Motorboat and Yachting magazine and did a Fastnet Race. 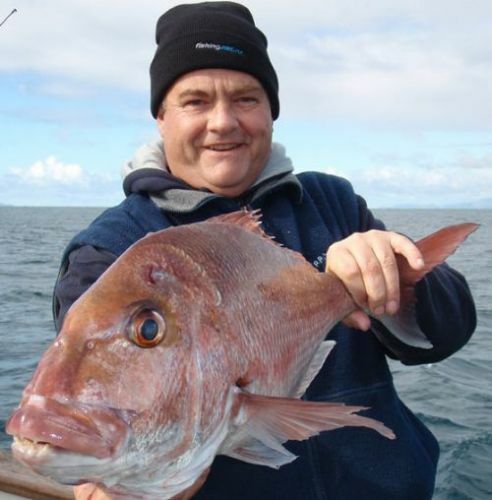 Back in New Zealand he married Lindsey, with whom he had two sons, and pursued his love of fishing as editor of Sea Spray magazine in the 1980s and early 90s. 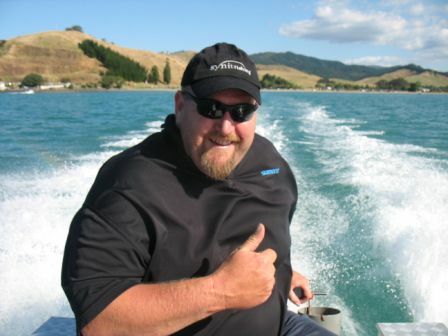 Later he set up his PR company, Shane Kelly and Partners, specialising in the marine industry. 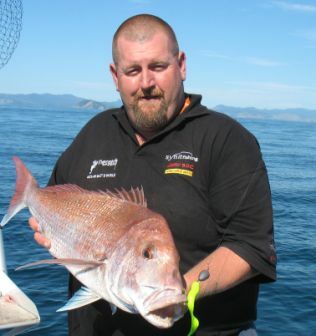 Shane was the lead Moderator on Fishing.net.nz right through until he was diagnosed with cancer and did a great job of keeping everything reasonably seemly while allowing forum members enough leeway to have some fun and get into robust discussion. His wit travelled at the speed of light and he was a wizard with the written word. A lashing from Bender on-line was a serious dressing down and it left grown men a mere shadow of their former selves" Grant Blair recalled. "I'm bloody glad I never had one" he added. On being diagnosed with cancer and with the prognosis relatively bleak, Shane made a bucket list. This included buying a motorbike; becoming a rock star ; writing a book – with Geoff Osborne: Great Motorcycles and People (available from Apexbikes.com). It is extraordinary what Shane was able to achieve in the face of adversity. He maintained his ‘mana’ in the marine industry as a journalist. He also remained true to his core values of family, friends and fishing to the end.